When it comes to stroke, every minute counts for the best outcome. At NorthShore, all four of our hospitals—Evanston, Glenbrook, Highland Park and Skokie—earned The Joint Commission's Gold Seal of Approval for Advanced Certification for Primary Stroke Centers. The recognition reflects NorthShore’s commitment to delivering the highest standard of care for stroke patients while meeting and exceeding critical quality performance measures designed to improve patient outcomes. Our integrated stroke program team also specializes in the diagnosis and treatment of other cerebrovascular conditions such as brain aneurysm, cerebral vascular malformations, vessel dissections, sinus thrombosis and carotid artery disease that place patients at high risk for stroke. The NorthShore Neurological Institute’s stroke team—led by vascular (stroke) neurologists, vascular neurosurgeons, physiatrists and advanced practice nurses—benefits from interdepartmental collaboration and participation in clinical research, including multicenter national and international stroke trials. 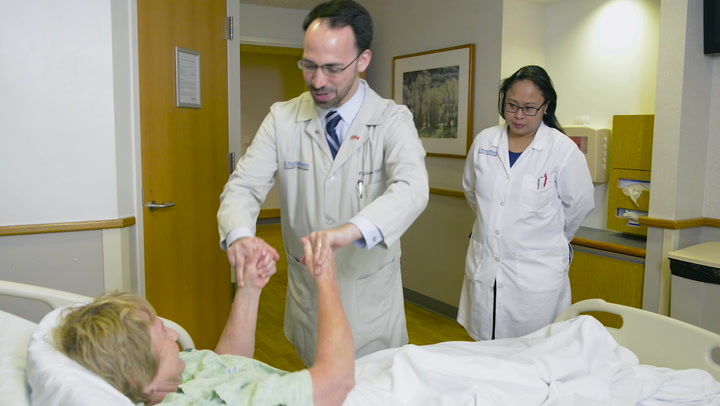 All members of the stroke team, including: Emergency Medical Services, Emergency Department physicians and staff, radiology, cardiology, laboratory services, vascular surgeons and neurosurgeons are always at a heightened state of readiness. The vast experience of our team allows us to promptly and properly treat stroke patients. Backed by sophisticated acute medical and surgical treatments, our system-wide electronic medical record system and the latest technological advances, our team offers the highest level of stroke care in Chicagoland performed by leaders in the field of stroke. Collaboration between our various team members is at the center of how we approach stroke care. All four of our emergency departments have telestroke capabilities—via phone, computer access to electronic medical records and two-way video conferencing—to connect various system-wide stroke experts together to ensure timely decision making on the best stroke treatment options for ischemic stroke cases. F (Face) – A sudden droopiness, tingling or weakness of one side of the face. A (Arm) – A sudden numbness or weakness of one arm, one leg (same side) or both arm and leg on one side of the body. S (Speech) – Sudden slurring of speech or trouble speaking and understanding language. T (Timing) – With the onset of any of the symptoms, timing is imperative. Call 911 and asked to be taken to the nearest Primary Stroke Center. The first step in effective stroke treatment is an accurate diagnosis. From the moment a potential stroke patient comes through our doors, our specially trained stroke team coordinates efforts to ensure that the best course of action is put into place immediately. This includes advanced cranial imaging (including CT and MRI scans) to determine the best stroke treatment options. Care at NorthShore is always personalized, taking into account the type of stroke and the patient’s unique medical history and medical conditions to implement the best treatment possible. Medical / Drug therapy. Our team uses a clot-busting medication—an intravenous administration of a thrombolytic drug t-PA that effectively dissolves blood clots when given shortly after the onset of stroke symptoms. Medical / Drug therapy. This treatment may be administered to help decrease the blood flow. Surgical options. Our dual fellowship trained and board certified vascular neurosurgeons, who are specially trained in neuroendovascular techniques, may perform an open or minimally invasive procedures to repair damaged blood vessels and stop bleeding. Treatment may also include closing off the bleeding blood vessel with metal clips or inserting endovascular coils to stop the bleeding from within the vessel. This option is most commonly used for brain aneurysms and vascular malformations. Patients also benefit from the attention of advanced practice nurses committed to the care of stroke patients and their families. These nurses offer thorough follow-up education and support both during and after stroke treatment. At NorthShore, we also have an inpatient rehabilitation unit at Evanston Hospital to help patients, such as those recovering from acute stroke and who need additional care, to better transition to home and outpatient therapy services. Please call 877.570.7020 for more information on stroke symptoms and treatment or to schedule an appointment with one of our specialists. Dr. Shakeel Chowdhry discusses the difference between ischemic and hemorrhagic stroke. Learn more about the different types of stroke in this brief animation. Allen and Cindy Bean share their journey from stroke to rehab to recovery at Highland Park Hospital. Maureen Pekosh talks about the collaborative stroke care she received at NorthShore and her road to recovery.